iTunes recovery mode (iPhone recovery mode) is a state when your iOS device displays a “Connect to iTunes screen”. Sometimes when you update or restore your iOS device, your device may get bricked, freezing, completely unresponsive, etc. you’ll need to put your device into recovery mode and restore it with iTunes. Or your iPhone, iPad, iPod stuck on iTunes recovery mode during iOS update/jailbreaking, you’ll need to an efficient way to get your device out. In this article, we will show you top 2 ways to enter and exit iTunes recovery mode on iPhone X/8/8 Plus/7/7Plus/6s/6/5s/5 and iPad, iPod. Part 1: How to Enter and Exit iTunes Recovery Mode Manually? Traditionally, you can use the manually method outlined below to enter or exit recovery mode. Note that if you operate mistakenly, you may fail to enter or exit recovery mode properly. Firstly, make sure your iPhone is already turned off. For iPhone X/8/7/7Plus: Plug it into your computer and make sure iTunes is running -> Press and hold down the Power + volume down button ->Release the volume down button when you see the Connect to iTunes screen. For iPhone 6s/6/5s/5 and iPad, iPod: Hold down the Home button+ Sleep/Power button -> Plug it into your computer and make sure iTunes is running-> Keep holding down the Home button until you see the Connect to iTunes screen. If your iPhone, iPad or iPod unfortunately stuck on iTunes recovery mode, the traditional way is restoring your device with iTunes. Connect the device to your Mac/PC while iTunes is open. A message should pop up and say that your iPhone is in recovery mode and needs to be restored. Choose Update and follow the prompts in iTunes to update your device. After the update completes, your device is already out of recovery mode. Can’t enter iTunes recovery mode with method above? iTunes cannot recognize your iPhone in recovery mode? 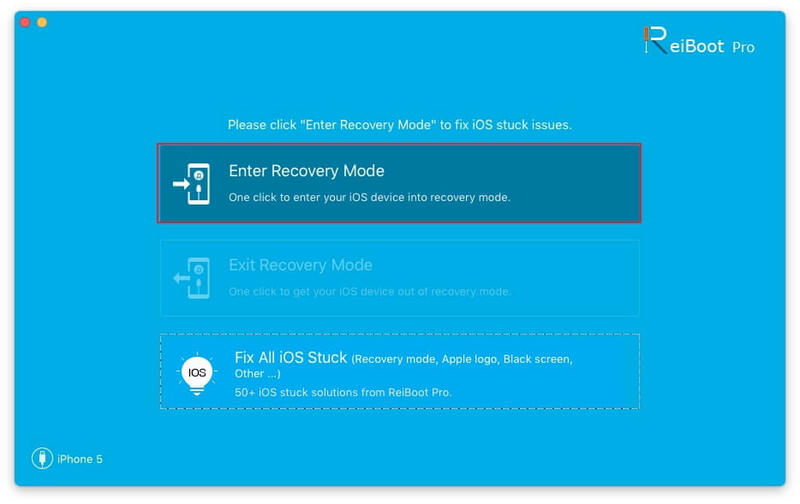 Compared to the traditional way, an easier way is using Free Any iOS System Repair (ReiBoot), a free software to enter and exit recovery mode on iPhone, iPad and iPod with only 1 click. To get started, free download and install Any iOS System Repair (ReiBoot) on your computer. Run Any iOS System Repair (ReiBoot) and connect your device to the computer via USB cable. Tap "Trust" on your device to trust the computer if prompts. After Any iOS System Repair (ReiBoot) detect your device, click on Enter Recovery Mode, and you will see your device in recovery mode(display the classic USB to iTunes logo) within seconds. Run Any iOS System Repair (ReiBoot) connect your device to the computer via USB cable. Any iOS System Repair (ReiBoot) will detect your device. Click on Exit Recovery Mode and your device will automatically boot up and out of recovery mode within minutes. That’s all for how to enter and exit iTunes recovery mode on iPhone, iPad and iPod. Moreover, if your iOS device get stuck, bricked, freezing, completely unresponsive, etc. you can upgrade to Any iOS System Repair (ReiBoot) Pro to fix all iOS stuck issues.